Note: This place is deserted! The code is very old and there is a better version now. Please go to the newer tutorial. 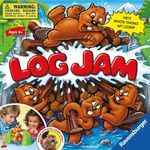 There are some frustrations regarding the lack of ease and convenience in play-logging on BGG. 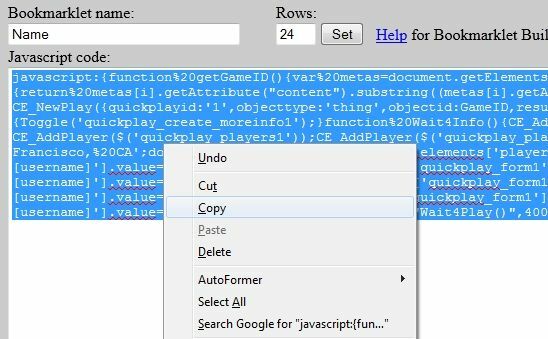 I'm particularly talking about having to enter the same information over and over, including your own username, having to click the "more" and "add player" links to open new windows for each new player, even if you have entered a quantity into the "number of players" field. 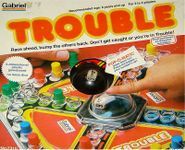 I'm announcing here that this awesome fellow has come up with a workaround that addresses some of our many play-logging woes. 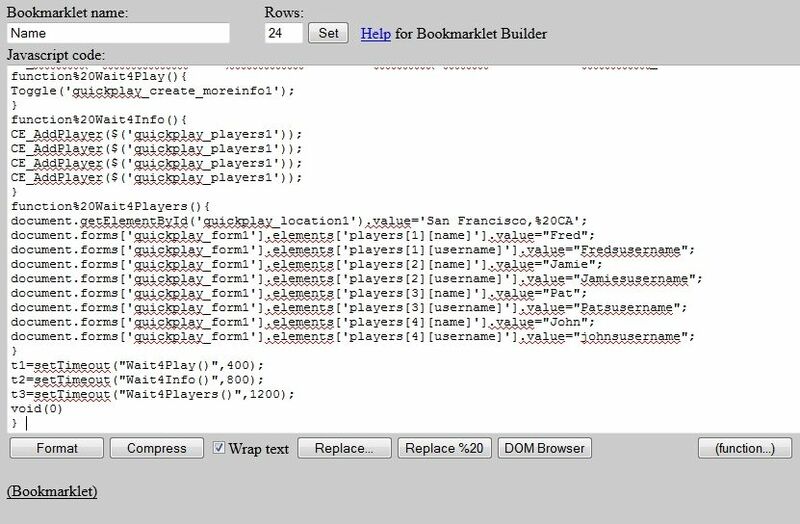 He made a bookmarklet that automatically inserts the location, usernames and names of players with whom you game frequently. It even pops open the "more" and "add player" windows for you, so all you have to do is enter the score and/or whatever data is custom to that particular play. 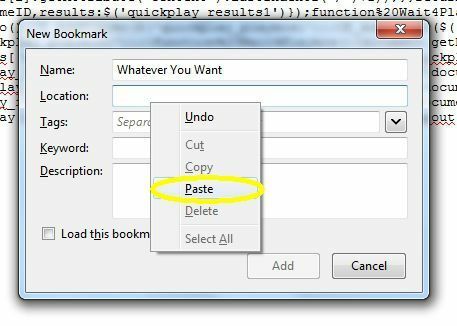 In order to use it, you have to alter the bookmarklet code to contain your name, your friends' names, and the location where you typically game. Then you open a new bookmark and give it some name you will recognize like "Me and Jamie at home" or "Wednesday gaming group." 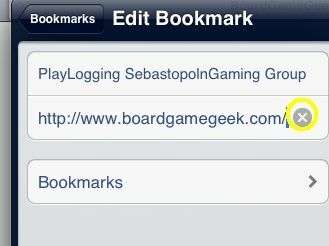 You paste the code right into the "Location" part of the bookmark. Repeat the process for every common gaming situation you want to be remembered. 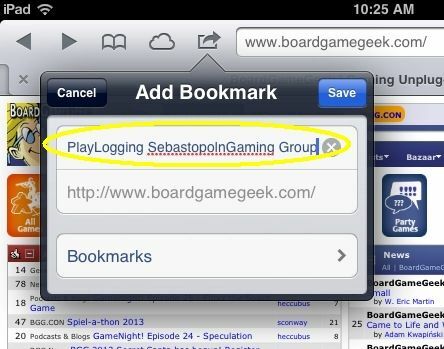 All the stuff that the bookmarklet inserts for you is entered just as plain text, so if you and your gaming group play at a different location one day, or you substitute out a regular player for an unknown this game, to log the play you just use the same bookmarklet you normally would and then make the one change by hand when you log the play. 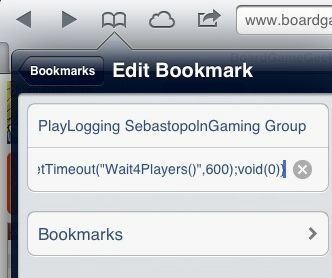 Here is how to get Dazeysan's play-logging bookmarklet to work for you. Beware that there are many images ahead. 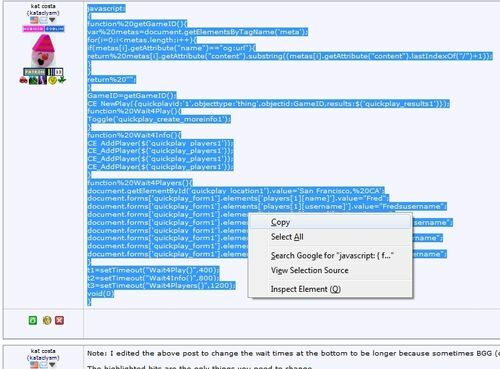 Now you have to go someplace where you can edit, and later compress, that code. 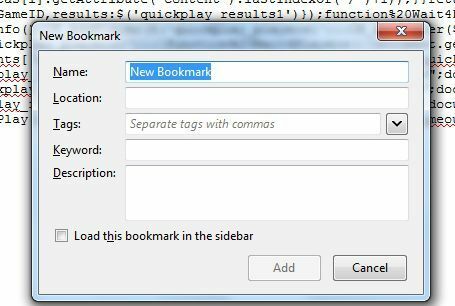 For this tutorial I'm using this bookmarklet utility site . If you have a different editor you want to use, feel free. First, see how the name "Fred" is here? Chances are your name isn't Fred. So highlight that text in the code and type your actual name. 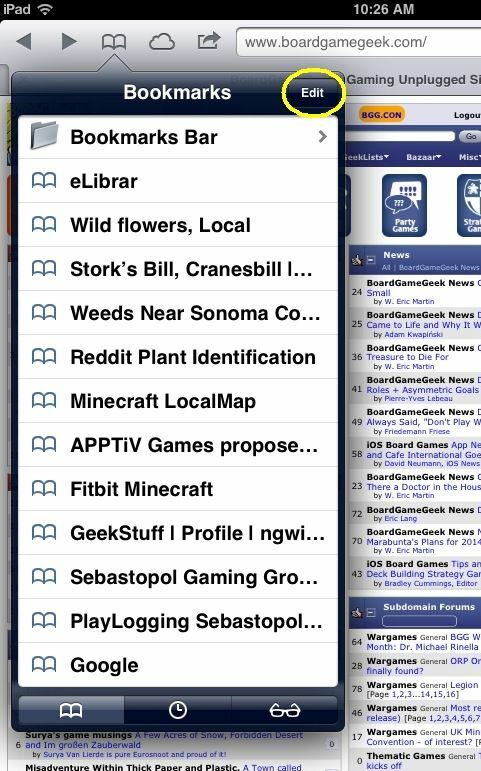 Now, see how just below "Fred," there's this "Fredsusername" text? Chances are your username isn't Fredsusername. So change it to your own. Keep doing that for the other fake names below. The sample code is set up for only 4 users. If you don't want that many, just delete two entire lines, one for the name and one for the username, for each player entry you want to get rid of. If you want to add more, just copy and paste the previous lines and change the names and usernames. An important thing about adding is that there are some numbers you need to change as well as the names. See here, how every player listed has a number in brackets? So if you wanted to add another player, you could just copy and paste John's information as two new lines, and then change the number in brackets to , since you're adding a fifth player. Then you just change the new name and username to whoever the new player is. See how there are four lines like that? 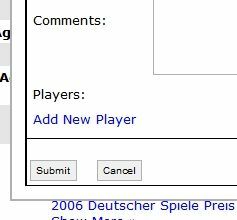 Those lines each click that annoying "Add New Player" link that you have to click to pop open a longer section of window each time you add a new player when you're logging a play on BGG. Not too hard? Still with me? Now just copy all the text. We're going to make a new bookmark that runs this code instead of going to a URL like most bookmarks would. 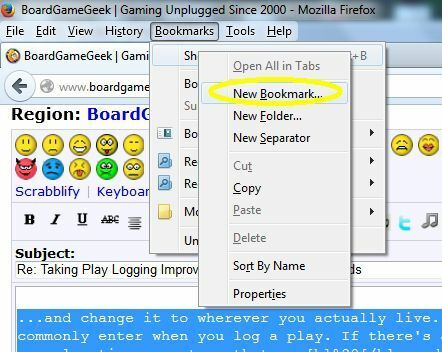 The instructions here are for Firefox, but there is a way to do this with any browser. iPad can run this code, too, but setting that up is a bit more complicated than with a desktop browser, so I've included separate instructions for iPad users below these instructions. 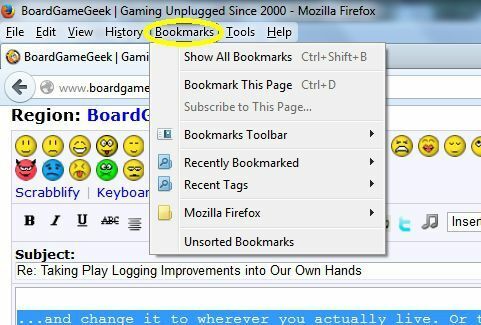 First, click the 'Bookmarks' menu. Then, from inside that menu, you right-click to get a second menu to pop up. 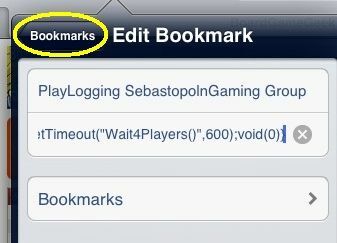 Inside that menu, hit "New Bookmark." 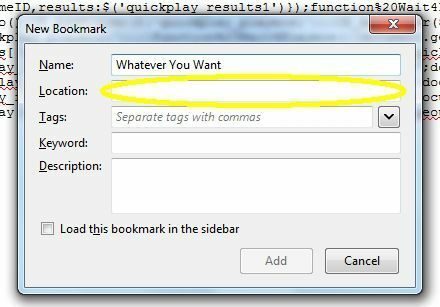 Name the bookmark whatever you want in the first field--something that'll remind you of what you've told the code to do, of course. 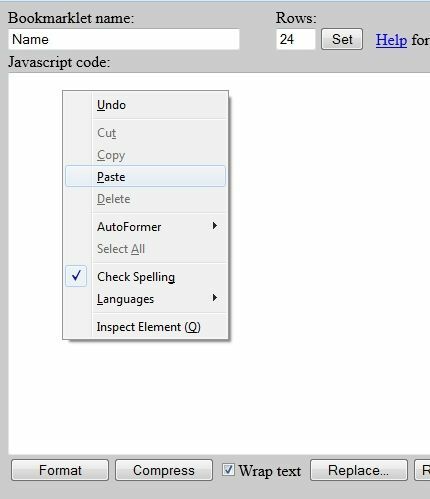 ...and paste that huge long line of code into it. Open up Safari and go to some website, and tap the little rectangle-with-arrow button. 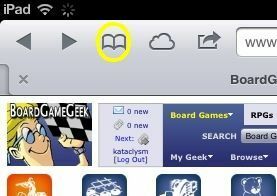 And tap the open book icon. It sure would be nice if at this point you could change what was in the second field. Because right now, your bookmark called "Tuesday Gaming with Friends from Work" leads to the random website you selected. But you can't change it now, so just hold on. You're going to have to save the bookmark as it is for now. 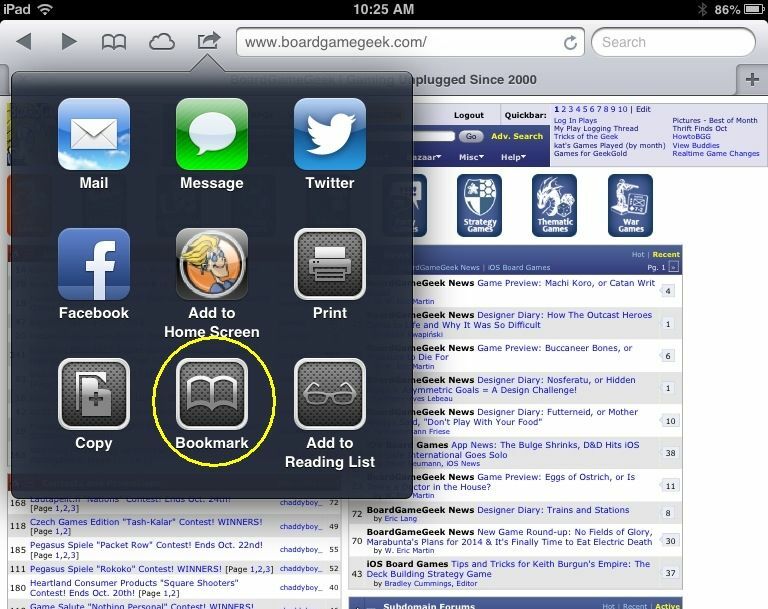 Now tap the little book icon at the top of the screen. Instead of going to any websites, tap the 'edit' button in the upper-right. 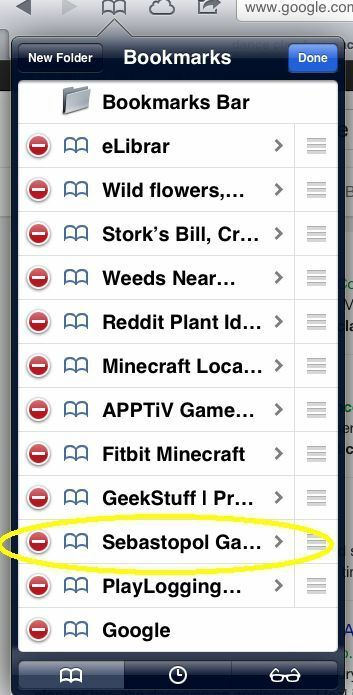 Now tap on that bookmark that you created. It brings up this screen. 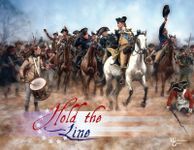 Click in the second field and clear the text. Now paste in the long line of code that you copied earlier, and the result will look like this. 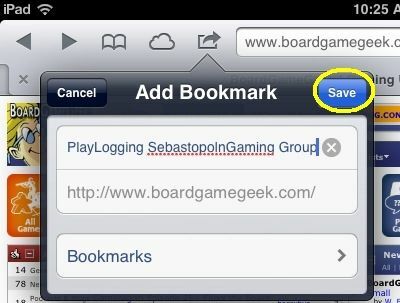 To save, click the 'Bookmarks' button. Now you can log the play in from your collections page, the game's dedicated page, or the search page by clicking to open the Record A Play window, then going up to "Bookmarks" and running the bookmarklet you made. 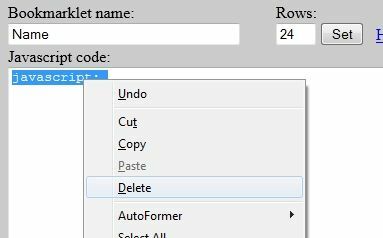 3) insert all the text you told it to remember into the right fields. ...and it does it for the other browsers the same way. 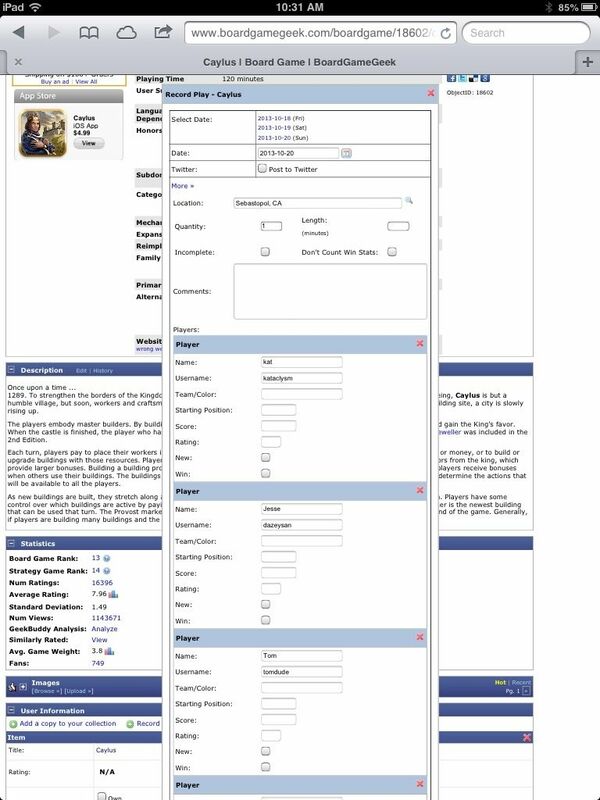 Now all you have to do is change the date, add in the scores, and write whatever other information you want to record that is specific to the play you're logging. This code is what you might call in Extreme Alpha; it's currently one day old. 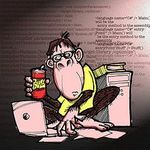 So if it doesn't work for you or if you think it could use tweaks, please gently post in this thread or PM me or the the author.